Sanjeev Sabhlok's Blogger blog: Why a second blog? I started with Blogger (sabhlok.blogspot.com) in 2004 but it had very few features, so in 2010 I migrated my relatively few posts till then to an independently hosted Wordpress blog called sabhlokcity.com - a domain I had purchased ten years earlier but used only to list things of interest. But managing Wordpress has proven to a nightmare, with a steep learning curve and incessant hacking. All Wordpress blogs will ultimately get hacked. There is no escape. Therefore I'm reconsidering returning to Blogger. I'll initially move the relatively unchanging/static blogs as subdomains of sabhlok.com, followed by migrating the main blog. I've still got to figure out a large number of issues, so this may take many months to implement. The other attraction of moving is that Google Blogger is likely to host these blogs free of cost well after I'm dead. Even when the custom domain can't be renewed (these domains are only available for ten years at a time), these Blogger blogs will hopefully revert to their original blogspot URLs and won't disappear from the internet till Google's plans change or Google disappears. 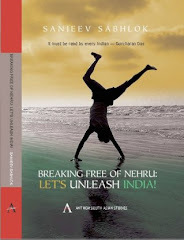 Breaking Free of Nehru, (Anthem Press, 2008). Now a free e-book (PDF) . Comment on the draft manuscript The Discovery of Freedom: A Concise Theory and Story of Freedom available as a free Word document at the moment. All copyrights on content owned by Sanjeev Sabhlok. Travel theme. Powered by Blogger.